It is rare in the lexicon of cinema that film's technical and artistic creators (as opposed to actors) enter the realm of “popular star“. Sure, in the 1950s / 60s Walt Disney, Hitchcock and Rod Serling would become household celebrities by hosting TV series. And in the ‘70s / 80s Spielberg, Lucas and Scorcese would find “geek fame” via a more film savvy culture propelled by the home video boom. Not so with composers, unless your name is Henry Mancini, Quincy Jones or John Williams. And even Williams' pre-1977 STAR WARS career is mostly unknown to the general public. In the early 1960s however a French born master would beat them all to the punch to become the world’s first bonafied film composer star. MAURICE JARRE would bring his themes to LAWRENCE OF ARABIA, DOCTOR ZHIVAGO and more to the whistling lips of an entire world caught up in the majesty and romance of epic 60’s cinema. While Maurice Jarre is certainly best known for the orchestral “pomp and circumstance” of his grand ethnic based period epics (SHOGUN, TAI-PAN, MOHAMMED: MESSENGER OF GOD, JESUS OF NAZARETH, THE MAN WHO WOULD BE KING), in the 1980s he would fuse classical sensibilities with the digital realm, creating some of the most lush and critically acclaimed electronic scores ever (THE YEAR OF LIVING DANGEROUSLY, WITNESS, GORILLAS IN THE MIST, THE MOSQUITO COAST, FATAL ATTRACTION) at a time when many of the era's keyboard practitioners were being panned as hacks. He’d also bring his distinctive musical voice to comedies and satires (TOP SECRET!, MOON OVER PARADOR), refusing to condescend to the subject matter or audience, but rather infusing the films with multi-layered musical complexity. And in an era when men like Williams, Jerry Goldsmith, James Horner and Danny Elfman “owned” the science fiction / fantasy mileu, Jarre would stake his own territorial claim with innovative scores to films like JACOB’S LADDER, GHOST, MAD MAX BEYOND THUNDERDOME, FIREFOX, DREAMSCAPE and ENEMY MINE. All this from a person with no initial interest in music … and who entered the field too late in life to learn piano. “Up until the age of 16 I knew no music. I had no musical training and couldn’t even tell the difference between ’A’ and ’C’ notes. Then one day my father brought home some old 78’ records and I put them on. I was stupefied by the sound. I remember that it was Liszt’s HUNGARIAN RHAPSODY No. 2. I immediately wanted to be a conductor. By the time that I really wanted to study the piano I was too old and it was too late for my finger muscles to develop properly. Fortunately a conductor friend, Charles Much, tried to help me. He said that I had a ’musical mind’ and told me that I had ’a good sense of rhythm’”. He studied composition at The National Conservatory of Music in Paris under Jacques de la Presle, Louis Aubert and most notably Honegger (Jarre later dedicating the concert work PASSACAILLE to Honegger in 1956). At the conservatory he’d also study percussion and play timpani (his beloved instrument later featuring prominently and powerfully in scores like LAWRENCE, ZHIVAGO, TAI-PAN, MOHAMMED and THUNDERDOME). “Being a percussionist was ideal for me", Jarre said, "You can hear everything that goes on in the orchestra and in the long pauses between cymbals and timpani, I could have some rest and watch the other instruments”. With it’s advanced world view the Conservatory required students to study the music of five different cultures, and the ones Jarre chose would (little did he know at the time) become the foundational building blocks to some of his most iconic future film works. He chose Russian (which would years later inform DOCTOR ZHIVAGO), Indian (to which he’d return in A PASSAGE TO INDIA), Japanese (SHOGUN, TAI-PAN), South American (MOON OVER PARADOR, A WALK IN THE CLOUDS) and Arabic (LAWRENCE OF ARABIA, MOHAMMED: MESSENGER OF GOD, LION OF THE DESERT, JESUS OF NAZARETH). His interest in the burgeoning (though at the time primitive) field of electronic music realization would also begin here. After graduation his first foray into composition for dramatic narrative would be as arranger/conductor (and occasional player) with the orchestra of the Jean Louis Barrault Theater Company. In 1951 he’d join actor Jean Vilar and his Theatre National Populaire to compose scores for plays such as RICHARD II, NUCLEA and MACBETH, then his first film score would be for director Georges Franju’s anti-war documentary short HOTEL DES INVALIDES. After a handful of other shorts and features with Franju, he’d find himself as one of France’s most in demand composers, churning out “Avant-Garde” classical ballets like MASQUE DES FEMMES (1952), NOTRE DAME DE PARIS (1965), MOUVEMENTS EN RELIEF (1954 - for his beloved percussion in conjunction with piano), and MOBILES (1961) before being approached by producer Sam Spiegel and director David Lean to compose 1/3rd of the score for their in-the-works epic LAWRENCE OF ARABIA - the other 3rds at the time to be realized by classical music legends Benjamin Britten (“Death In Venice”, “Peter Grimes“) and Aram Khachaturian (the ballets “Spartacus” and “Gayane”). 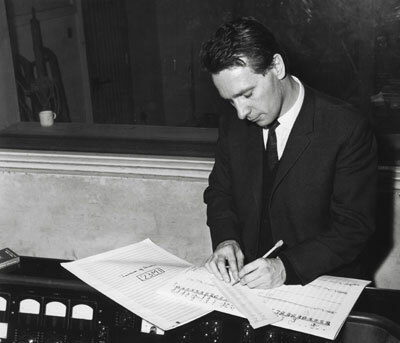 When however Khachaturian was unable to leave Russia, and Britten later said he'd require a year to compose his part of LAWRENCE, Spiegel - still not confident in the young Jarre handling the entire project himself, brought in Broadway legend Richard Rogers to split the duties with Jarre. But Lean wasn't at all thrilled by what Rogers had written. In a 1992 interview with film journalist Joe Leydon, Jarre recalled, "The first time I met David was when he and I and Sam Spiegel were in a London studio listening to a pianist play the music that Rodgers had written in America. The pianist began by playing the main theme, and then something called, if you can believe it, 'Love Theme for LAWRENCE OF ARABIA'". "Sam, what is this rubbish? ", Lean bellowed at Spiegel. In response an embarrassed Spiegel then demanded that Jarre play on the piano some of what he had composed. And, with his back to both the producer and the director, the young French musician started in on what would later come to be known as his world famous LAWRENCE OF ARABIA theme. "I could not see how they were reacting", Jarre remembered, "But right in the middle of my playing, I felt a hand on my shoulder. And I could hear David saying, ‘Sam, this young chap has exactly what I want'". The entire assignment suddenly fell to Jarre, who had to compose nearly wall to wall music for the 3 ½ hr. + epic within a scant four week time frame, sleeping only 2 - 3 hrs. per night. It was a musical marathon-run well spent. The score to LAWRENCE OF ARABIA would win Jarre his first Oscar and go on to become one of the most beloved, remembered and repurposed pieces of not only film music … but pieces of music period in recorded history. Jarre had become a worldwide classical "pop star”. His next film with David Lean would come to epitomize 60's era cinemtic romance, but would also prove itself the epitome of creative irony as well. 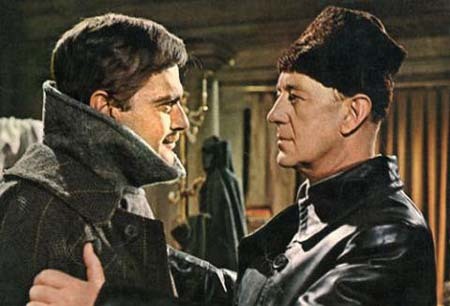 1965’s DOCTOR ZHIVAGO (an intelligent, emotional and politically trenchant film narrative distilled from Boris Pasternak’s epic and “un-filmable” 1957 Pulitzer Prize winning novel / poem) would emerge as one of the most loved films of all time - nominated for ten Academy Awards, winning five (including one for Jarre’s score), becoming the 8th all time U.S. box office champ (adjusted for inflation), setting off a 1960s era fashion trend, and even causing a disproportionate rise in the names of female children being named “Lara” over the next decade. At the time of it’s initial release however it was panned by critics to such a degree, director Lean for a while never wanted to direct another film. At it’s core a poetic treatise on the human soul forever caught in the crossfire between the head and the heart, it’s difficult-to-explain philosophical intent is carried to the audience under the guise of an easier-to-digest-and-explain “assumed identity” narrative wherein physician / poet Yuri Zhivago (Omar Sharif) spends his life attempting to reconcile the two great loves of his life. On the surface the juggling act appears to be between his affection for lovingly devoted and demure wife Tonya (Geraldine Chaplin) against his passion for the emotionally scarred and fiery mistress Lara (Julie Christie). Below the surface however the “love of two women” structure ends up being a mere metaphor for the more soul-splitting (and ultimately psychologically damaging) desire to understand the physical sciences (with it’s comforting ability to decipher and explain life and nature) vs. the vagaries and (at times tragic) beauty of human nature with all it’s wonderful and magical messiness. The irony would continue with Jarre’s scoring of the film. In an interview commemorating ZHIVAGO’s 1995 30th Anniversary restoration, remastering and re-release Jarre reflected how, while blessed this time around with much more time to compose his score, things would be considerably more difficult. Even getting the job itself was tougher. “The spotting sessions were very easy with David (Lean) because he knew exactly what he wanted. But he was also very demanding. During rehearsals, he was always there with me and the orchestra. During recording sessions, he was always in the booth. I remember him saying, ’Maurice, do you think the clarinet can come up a little without actually hearing the beginning of the line?’. He was so tuned into the music. When he passed away, I lost not only a great director, but a great friend. After we finished working on LAWRENCE, David began on ZHIVAGO. By that time I had immigrated to the the United States, and he didn’t know how to reach me. He called the MGM music department and asked if they had my phone number because he wanted me in Spain to work on the new film. The music director there told him, ’Mr. Lean, you know Maurice is a very good composer for space and sand, but we have better composers for snow and Russia’. David laughed and told them that no matter what, he wanted me in Spain right away. I remember the MGM music department classified everything - there was even a department that specialized in main title themes. No matter what composer wrote the score for any particular film, he had to give the main title theme to this special department. I was absolutely stupefied. When I began writing the music for ZHIVAGO I told them I was writing my own main title. (And) they looked at me rather suspiciously - 'Oh, this Frenchman is strange!'”. “ ‘ Maurice, forget about ZHIVAGO, forget about Russia. You go with your girlfriend to the mountains, because I know you like mountains, and you think about it and write a love theme for her’”. Jarre continued, “I returned to Los Angeles and spent one weekend in the Santa Monica mountains. That Monday morning I wrote my fourth them. David heard it and exclaimed, ‘That’s it!’. Sure thing it was ‘Lara’s Theme’. I had learned a lesson in perfectionism from David. He was a perfectionist, in every way. If you play ‘Lara’s Theme’ on the piano you know it has little to do with Russia, but rather it is a very simple love theme”.